1/5 nuevo is a Spanish restaurant and bar on Star Street, opened by the Elite Concept Group, the proprietors of Ye Shanghai, Cinecitta and Nanhai No. 1. The setting is casual, yet lush – you could choose from bar tables with stools to comfortable suede couches, depending on your mood. Its convenient location and approachable drinks menu make 1/5 nuevo an attractive place for post-work drinks. I decided to come and try out their set dinner menu priced at $238 per person (you could add $88 for a wine tasting set of 4 wines), which is available throughout July and August. Even though the food at 1/5 nuevo was very far from exceptional, there was an additional 20% off the bill on Sundays, which made our meal quite a bargain. There is also a “One Price Concept” on Monday nights with a full round of tapas (you can order more after you have finished one round), plus unlimited drinks for $388 per person. 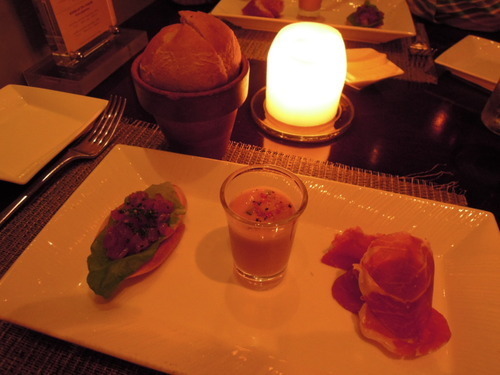 (1) The first course of the set dinner was the cold tapas platter. On the left was the spicy tuna on toast. The “spicy” tuna was, in fact, not spicy, and it tasted a bit bland. In the middle was the gazpacho soup, which was in the colour of thousand island dressing, and had a delicious, fresh taste of peppers and a great chunky and grainy texture. On the right was the iberico ham, which was beautifully aged and had a deep, alluring taste. The bread was light and fluffy, and I loved the fact that it was placed in a clay flower pot – this kept the bread warm for a long time! (2) Then came the second course and also the best part of the meal, the hot tapas. 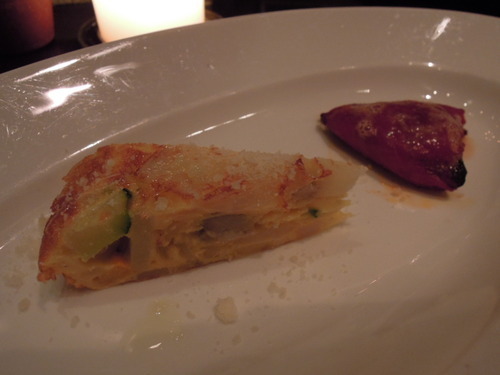 On the left was the “nuevo” tortilla de patatas, which was a Spanish omelette with egg and potatoes. It was warm and freshly fried, the potato was scrumptiously soft while the egg was suitably crispy, and the layering of potatoes and eggs gave an attractive texture. 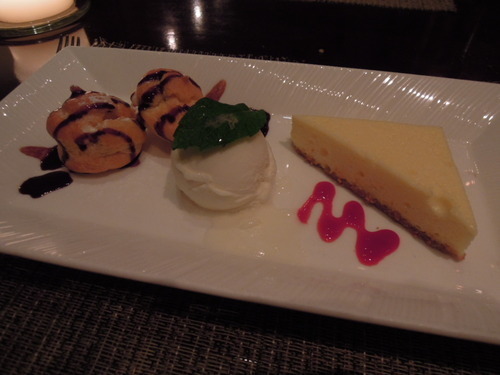 The restaurant sprinkled it with a bit of cheese powder, which added extra flavour and richness. On the right was a piece of pequillos stuffed with crab meat. The beaten crab meat was wrapped in a piece of red pepper. I could taste the fresh crab flavours, and the red pepper’s veggie taste was a great complement with the seafood. 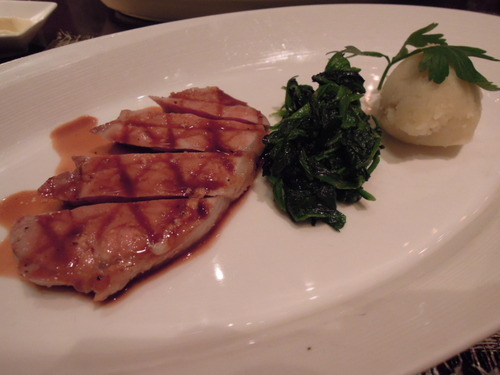 (3) For the main course, we could choose between the pan-fried halibut and the grilled iberico pork. 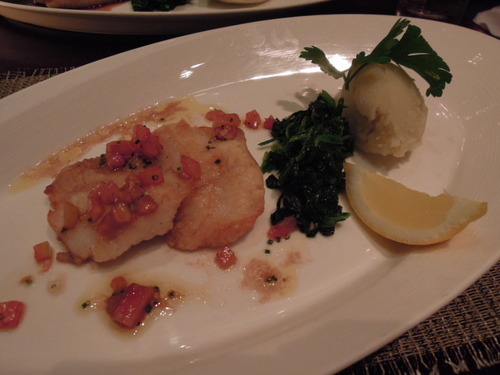 The pan-fried halibut with tomato salsa was soft and tender and it flaked delicately in the mouth. The halibut was nicely fried, and a drizzle of lemon juice cut through the buttery taste. The tomato salsa then added a refreshing note to it. The mashed potato on the side, however, tasted peculiar, and for almost 15 minutes I couldn’t figure out why it tasted different from other mashed potatoes. I had to resort to asking the manager in the end, and found out that the chef used olive oil (instead of butter) to season the mashed potatoes, which explained its vegetable taste. Healthy indeed, but not too yummy! (4) The grilled iberico pork with cinnamon sauce was disappointing. Even though the meat was reasonably juicy, its texture was tough and chewy. I liked the hint of black pepper seasoning, but I could barely detect the taste of cinnamon in the cinnamon sauce. Moreover, its presentation was really ordinary. Conclusion: I like the glitzy decor of 1/5 nuevo, and it is a charming venue for drinks. However, the food quality was below average and the service was absent-minded. Surely, one would have expected something better from the Elite Concepts pedigree!